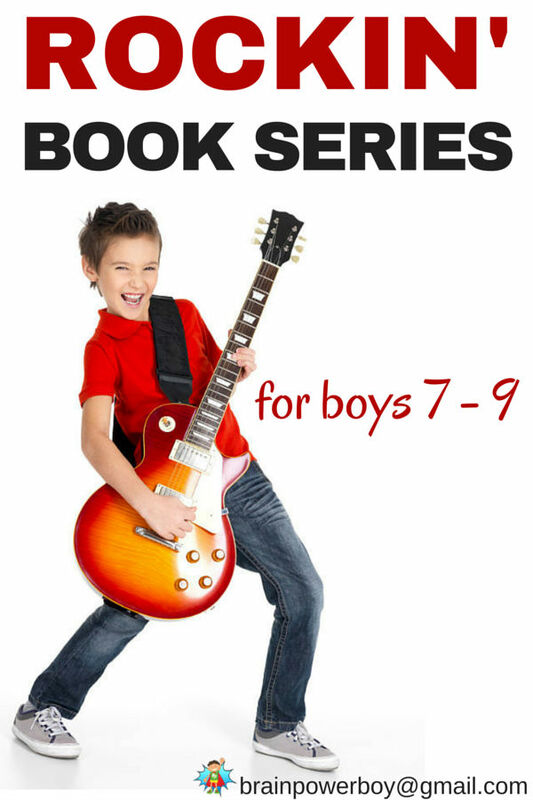 Rockin' Books Series for 7 - 9 Year Old Boys! Boys don’t just want to read any old book. They want to read books that rock! You know, the really good ones that they can’t put down and totally have to tell their friends about. As you may already know we are big fans of book series and love to plow through a whole series just as fast as our eyes will let us. I was looking through a bunch of our books and found some great book series for 7 – 9 year old boys that meet the rockin’ qualification. These are all really good! Check them out. 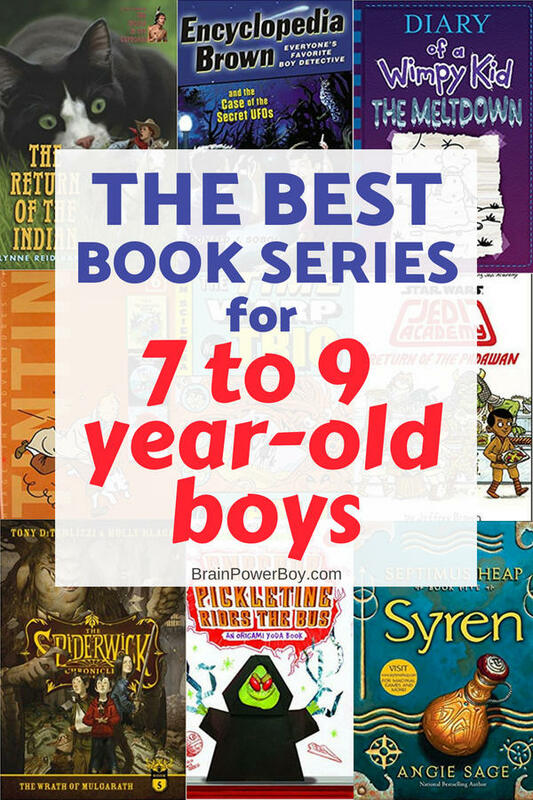 They made our best books series for boys list, and that says a lot. I know many, many boys have really loved these titles. Getting boys into reading book series when they are young is a great way for them to really get to know characters and not be afraid of reading bigger books. The Knights of the Kitchen Table (Time Warp Trio) is awesome. These books are short, have fun illustrations and include a bit of history to boot. If your boy has not read these yet, get a few! If he read a few, get some more. With over 15 books already and counting you will have plenty to choose from. Each book is somewhat independent of the others but they are best read in order. I love these for reading aloud. The Field Guide (Spiderwick Chronicles Series) is the beginning of a five book series featuring twin boys, their sister and an adventure that begins with a move to an ramshackle Victorian house where they find an old handwritten and illustrated book – the field guide. Features elves, goblins, dwarves, trolls, and other fantasy creatures that your guys will really go for. Some dark-ish parts but not too scary. Who is the boy who can solve cases that the police can’t figure out? Why Encyclopedia Brown, Boy Detective (Encyclopedia Brown Series) of course. The neat thing about these books is that kids can try to solve the mysteries right along with EB. There are 10 mysteries to solve in each book. I thought my son would really like these but he didn’t. Other boys have gone through the whole entire series and just loved them. Try one and see what your boy thinks. If he does like it there are over 27 titles for him to work his way through. When it first came out, The Strange Case of Origami Yoda was a super popular book series with waiting lists for the books at many libraries. It is still very popular with the boy readers I know. The whole series centers around a group of kids and the oh-so-wise Origami Yoda who happens to be a finger puppet and the question is – is he real? Entertaining and very funny, this book is set in middle school with crushes, homework issues, friendship etc. Fun illustrations and directions for making Origami Yoda are a bonus. When the author announced there would be no more Origami Yoda books, a collective gasp was heard by boys, moms and librarians everywhere. We wouldn’t have a good list for this age group without mentioning The Indian in the Cupboard . What child doesn’t dream of the possibility of their toys coming to life? Take one special cupboard, a plastic Indian and you have a story that is sure to get your boys reading on through the series. Diary of a Wimpy Kid (Diary of a Whimpy Kid series) is a goofy, crazy romp through a boy’s life in middle school. The stick-figure-like illustrations are great and add to the amusement. I admit that these are not my favorite but my son and a gazillion other boys can’t be wrong. They love them. The author seems to be going strong with 9+ books. Some people will not like that this series is include on my list but hear me out. My son was pretty young at the time he picked these out at the library. I flipped through and saw smoking, drinking, guns and more and thought – oh. boy. However, TinTin in America (The Adventures of Tintin) has proved one of the best series of books we have had that led to good discussion on a wide variety of topics. There is violence, drunkenness, stereotyping, tempers and many other things that are good to discuss with our boys. Read one first and see what you think. Each of these books is a 3 volume set. The series is written in comic book format and is very appealing to boys 7 -9 years old and even older. People have described Magyk (Septimus Heap Series) as Harry Potter for the younger set and they would be right but it is a good book series that also deserves to stand on its own. The nice thing about this series is that it has humor, isn’t quite as dark as Potter, and the fantasy world is a good one indeed with brownies, wizards, dragons, boggarts, shape shifters, carnivorous trees and a whole lot more. There are 7 books in the series and Fyre was said to be the grand finale. With the love of all things Star Wars at an all-time high the author of Star Wars: Jedi Academy (Star Wars: Jedi Academy Series) has a hit on his hands. These books are graphic novels set at Jedi Academy. Young Roan wasn’t expecting to end up as the oldest student at this school as he thought he would go to pilot school. However, he is stuck here and we get to read along as he details his life by drawing comics, notes and doodles for us to read. There are three books at the moment – many hope for more. There you have it, some rockin’ choices of book series for 7 – 9 year old boys. Oh and by the way, when your boy wants to start a new book series we suggest ordering the first one and three to four more right away. You don’t want him to have to wait to get into the next book in the series! So go ahead, show him the list, have him pick a few out and order them for your boy. We’re sure he will find something here he likes. If I missed any series that your boy really likes, please leave a comment below. This is an ongoing project and we will be writing follow-up articles. I look forward to seeing what you would recommend. Thanks! I have not heard of the Encyclopedia Brown books before! Those do look awesome. Glad to pin for later. Thank so much for this list! I’m looking forward to checking out many of these for my oldest son to read aloud together and for when my youngest son is a little older! Another series we have started and plan to read more of is Doyle and Fossey, Science Dectectives by Michelle Torrey. They are thrilling, age appropriate, short chapter books with scientific knowledge weaved throughout. Thanks so much for the comment. Glad you like the list. We love reading aloud – great to hear you do too. I appreciate the suggestion. We have not heard of that series and will be sure to check it out! It sounds great. Saving this list of recs as I have a son going into the 3rd grade and think we need to keep him motivated with really interesting series. Thank you for posting this! Thanks for visiting Joann. I’m glad to hear you are saving it. I hope your son finds some titles he likes. My son reads very well but doesn’t like to take the time to read so book lists like this are great, pinned! Thank you for pinning Susen. Some boys are simply too busy for reading and that is ok too.